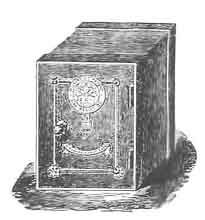 The most significant event to affect the future design of all safes made in Britain was the Cornhill Robbery. It was not that it was the largest loss at the time, but that it was the 'one too many' after four other successful safebreakings in the City. Within the previous twelve months the safe of Thomas McKeown, bullion dealer of Fenchurch Street had been opened by a combination of picking and skeleton keys, that of Johnson the Jeweller of Threadneedle Street suffered a similar fate, as did the safe of Baum, a bullion dealer in Lombard Street, Abrahams in the Strand, and then on the 6th.of February, the safe of Walkers' Jewellers in Sun Court, Cornhill. London. It was not so much the total of the losses which upset the City Fathers - about £840,000 in today's money - as the fact that the safes of the day were 'unfit for use'. It was not only the safemakers who came in for criticism as the following extract illustrates. "In every case, the robbery was effected in spite of what was considered sufficient precautions. The thieves eluded the vigilance of the police and broke into the strongest safes with complete success." The Chief of Police gave the following reasons for the ease of crime. "trusting to gaslight and publicity for the security of property - police protect from outside - could not guard against thieves concealed on premises from Saturday night to Monday morning". More significantly -"unexpected insecurity of the best iron safes". The criminals involved were caught and were brought before the Lord Mayor in the Justice Room of Mansion House where the main perpetrator Thomas Caseley was found guilty and sentenced to 14 years penal servitude in Millbank Penitentiary. The story does not end there however as on the 14th.of February the following year, the civil case of Walker v Milner came before the Lord Chief Justice in the Court of Queen's Bench, Guildhall, which was an action taken by Mr.Walke r "a well known jeweller in Cornhill " against the firm of Milner & Son of Moorgate Street for breach of warranty. It was through evidence given in this action that the failings of what had been sold as a thiefproof 'Holdfast 'safe came to light when the convicted safebreaker Caseley stated that he had opened the safe with wedges and levers in 35 minutes. He went on to say that had he been able to work on the safe uninterrupted (he was given signals by string by his watcher when the police patrols were passing every nine minutes) he could have done the job in 15 minutes. The accuracy of this evidence, true or false, is only partly relevant as it was clear that the safe which had been sold as being of the strongest quality was not as described. However Walker was unsuccessful in his action as it was judged that circumstances permitted adequate time for an attack of any kind to take place without interruption. The adverse publicity surrounding the trial acted as the catalyst which prompted every safemaker in the country to seek such improvements to their safes as would make this type of attack totally impractical in future. Within the twelve months from February 1865 to March 1866, British safemakers took out a total of 36 new patents, all of which were designed to strengthen the linkage of door to body. Of these only six were subsequently abandoned.